SOHO is stationed 1.5 million kilometres out, on the sunward side of the Earth, where it enjoys an uninterrupted view of the Sun. Every day it sends thrilling images from which research scientists learn about the Sun's nature and behaviour. Experts around the world use SOHO images and data to help them predict bad space weather affecting our own planet. SOHO moves around the Sun in step with the Earth, by slowly orbiting around the first Lagrange point, where the combined gravity of the Earth and Sun keep SOHO in an orbit locked to the Earth-Sun line. Built for ESA by Europe's aerospace industry, SOHO is a project of international cooperation between ESA and NASA. Of the spacecraft's 12 sets of instruments, nine come from multinational teams led by European scientists, and three from US-led teams. More than 1500 scientists in 20 countries are directly involved in SOHO's instruments and research programmes. NASA launched SOHO and is responsible for communications and daily operations. SOHO is part of the first Cornerstone project in ESA's science programme, in which the other part is the Cluster mission. Both are joint ESA-NASA projects in which ESA is the senior partner. 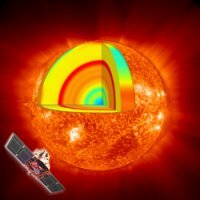 SOHO and Cluster are also contributions to the International Solar-Terrestrial Physics Programme, to which ESA, NASA and the space agencies of Japan, Russia, Sweden and Denmark all contribute satellites monitoring the Sun and solar effects. SOHO's science ranges from the Sun's hot interior, through its visible surface and stormy atmosphere, and out to distant regions where the wind from the Sun battles with a breeze of atoms coming from among the stars. Discoveries include complex currents of gas flowing beneath the visible surface, and rapid changes in the pattern of magnetic fields. In the atmosphere SOHO sees non-stop explosions and also remarkable shock waves and tornadoes. After it went into space in 1995, SOHO was meant to operate until 1998, but the mission is so successful that it has already seen several extensions and currently has approval until end 2018 (subject to a mid-term review in 2016). The extensions enable SOHO's scientists to compare the Sun's behaviour (e.g. the sunspot activity) not only at different times in one solar cycle, but also during different solar cycles. SOHO disappeared for several weeks in 1998, but it was recovered and brought back into operation after a gap of more than four months. Other difficulties came with the loss of the gyroscopes used to control the spacecraft's orientation. Despite these problems, engineers have kept SOHO functioning with all its instruments performing well.